Strange fruit (n): an expression of dismay upon seeing human bodies hanging from trees, the victims of murder, lynchings perpetrated by those who considered those they killed less than human. Fabrizio Cassol adopts the jazz-blues standard as the title of his project, Strange Fruit (Instinct Collection, 2017). Cassol plays alto saxophone. The musicians who appear in mix-and-match combinations are Baba Sissoko, vocals, ngoni, tama and tamani; Diely Moussa Kouyate, guitar; Zoumana Tereta, so kou; Magic Malik, flute; Laurent Blondiau, trumpet; Bo Van der Wert, baritone saxophone; Michel Massot, trombone; Stephane Galland, drums; Michel Hatzigeorgiou, electric bass; Oumou Sangare, vocals; La Choraline, choir; Eric Legnini, keyboards, Hammond organ; Manu Codjia, guitar; Claron McFadden, vocals; Makhan Cissoko, vocals and tama; Djimbe Sissoko, vocals and tama; Bazoumana Sissoko, vocals and tama; Djatourou Sissoko, vocals and tama; Yacouba Sissoko, vocals and tama; Fabian Fiorini, piano; Kris Dane, vocals and guitar; Melissa Givens, vocals; Marie Daulne, vocals; Hamane Toure, guitar; Sekouh Bah, electric bass; Dejeneba Dansoko, backing vocals; Pamela Badiogo Mahapa, backing vocals; Renauld Crols, violin; Kezia Daulne, vocals; David Linx, vocals; Sarah Klenes, backing vocals; Anu Junnonnen, backing vocals; Aka Moon jazz trio. The set opens with “Didadi Horns,” which blends an African cultural motif with a touch of funk. Baba Sissoko has the lead vocal. The horns are reminiscent of some late 1960s or early ‘70s songs or film scores composed by a combination of Lalo Schifrin, Isaac Hayes or Quincy Jones. It’s a call to gather and freedom. There are two takes on the album title. “Strange Fruit” features a duet, pianist Legnini accompanies Claron McFadden, who delivers the lyrics with the control of an opera singer and the smoothness of a jazz lounge crowd pleaser. “Strange Fruits” brings in La Choraline to support McFadden, along with a larger instrument ensemble. Hatzigeorgiu’s bass line is a strong hook throughout. The arrangement blends the Billie Holliday rendition with Johann Sebastian Bach’s “St. Matthew Passion.” The first segment is a haunting, ethereal take on the song. Then the male vocalists take point, with a greater percussive presence underneath. A gear shift, and it’s back to McFadden and the choir, but with more intensity than earlier. Ten of the 12 tracks are Cassol originals, with the vocalists contributing to eight of them. 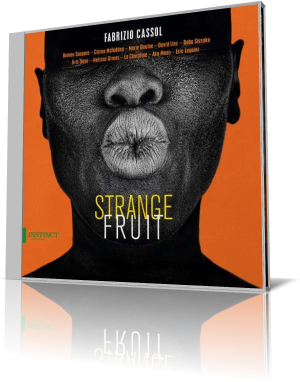 Strange Fruit captures a range of emotions, at times speaking to the world condition, spirituality or romance. The music is fine throughout, but it’s the beauty brought forth by the vocalists that lock this one in as a keeper. The album was originally released by Blue Note in 2012. The Instinct Collection release is its U.S. debut.